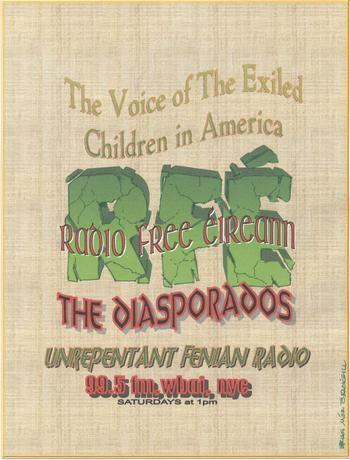 Radio Free Eireann will broadcast this Saturday April 8th on WBAI 99.5 FM radio or wbai.org at 12noon New York time or 5 pm-6pm Irish time or listen any time after the broadcast on wbai.org/archives. Ruan O'Donnell of the University of Limerick will discuss his speaking tour on the role of America's Irish Fenian exiles in spearheading the 1916 Easter Rising, 1916's unfinished business, and why some official Irish commemorations seem so concerned with not offending the British as they honor Irish patriots. Investigative journalist Eileen Markey talks about her book, Radical Faith: The Assassination Of Sr. Maura - the life of Maura Clarke From the Rockaway Irish Community and daughter of an IRA Volunteer in the War of Independence to being murdered by an El Salvador death squad in 1980. Go to Radio Free Eireann's web site rfe123.org where you can read written transcripts of some recent headline making interviews and get the latest programming information.